Somehow, I lost the telephone icon that appears on my homepage. 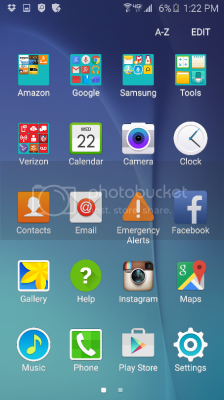 I had to do a factory reset and somehow or another, that phone icon disappeared. Does anyone know how to restore the icon? Thanks. Is it missing from your app drawer? No. It's missing from my homepage. Can you just drag it from your app drawer to homepage or am I missing something? Hmmm, interesting. Are you referring to the green icon with a white outline and white phone picture? Odd. I have it in my app drawer. It's nowhere to be found on my phone. Thanks for trying. Settings > Application manager > All... scroll down to Phone. Do you see it now? It was there, it just had to be hunted down. I removed TOUCHWIZ and replaced it with Google Now. When I went to Applications, I had to scroll over to ALL. The phone icon was there. I can't thank you enough for your patience and understanding to help a dummy like me. Thanks again. My phone will not turn on or charger after leaving it on a wireless charger all night? Lumia 630 how is the phone accessing my emails when I am not connected to wifi? How do I remove the phone icon from my lock screen? how can i fix privacy protection password in my phone? How do I reset my phone to factory & my touch screen if it is broken?